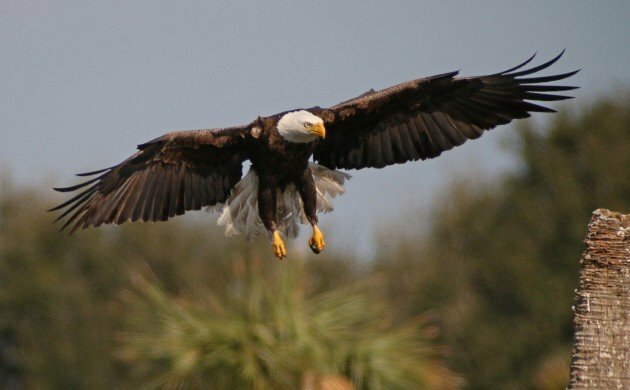 Back in January, when I was enjoying my attendance at the Space Coast Birding and Wildlife Festival down in Titusville, Florida, I had an enchanting encounter with our national bird, the Bald Eagle. The setting was the Viera Wetlands, a marvelous location that uses the ultimate waste product, sewage, and turns its processing into an incredibly rich wetland environment chock full of a variety of birds, an environment that is also greatly appreciated by a host of birders, photographers, and general nature lovers. And where there is a lot of wildlife there will also be other wildlife that shows up to eat the original wildlife. 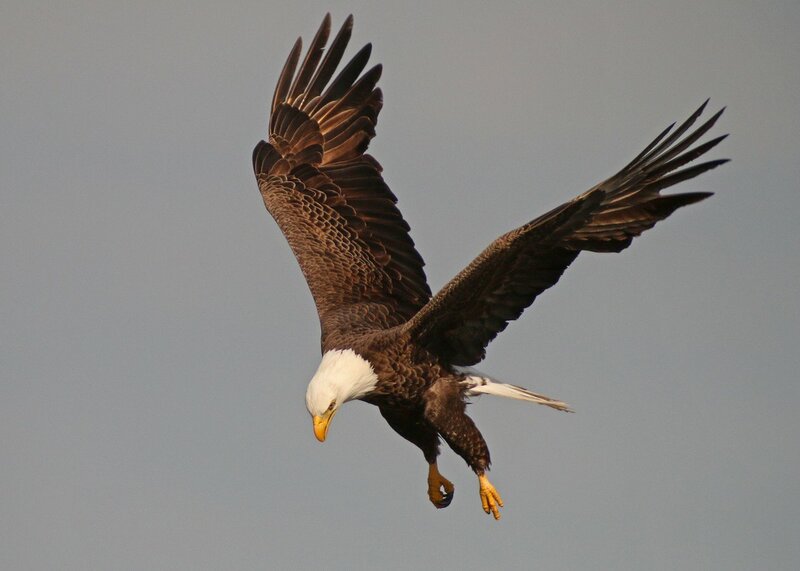 Such was the case with the Bald Eagle that I spotted. It was alternating between perching on a series of old, dead, tree stubs and doing its best to hover over some thick marsh vegetation. I figured that it must have spotted something good to eat there so I parked my car and starting digiscoping. 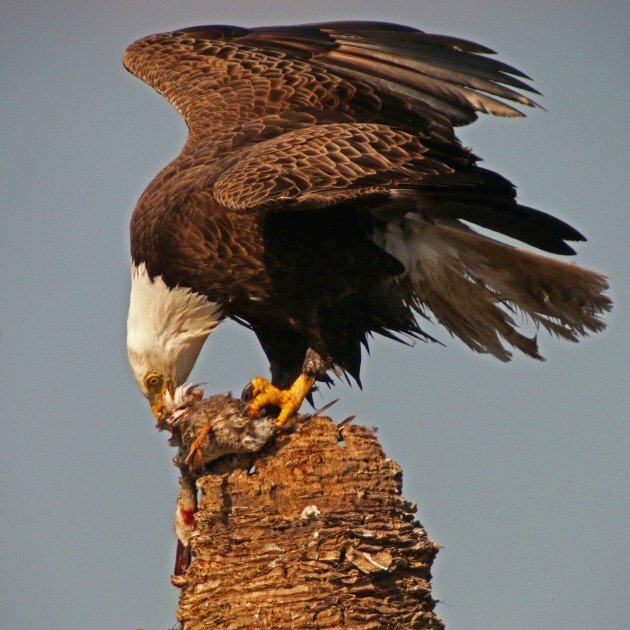 Considering that Bald Eagles are known for their scavenging I thought that I would soon see it grab a dead fish or something and then land back on the stub where it would eat it. Here the eagle hovers over the marsh, staring intently at something. It is doing the same thing in the image at the top of the post. 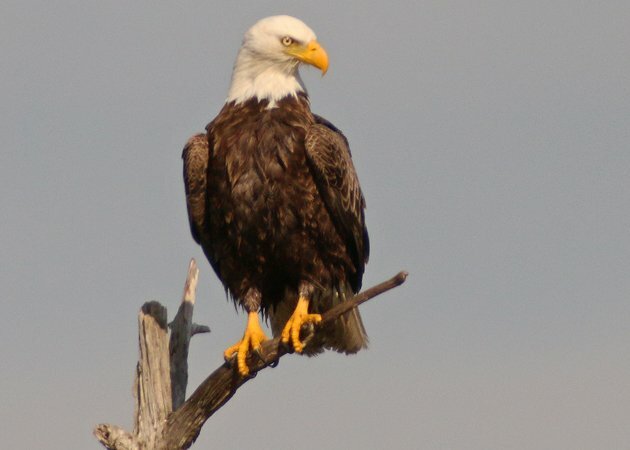 And here the eagle, after having hovered over the marsh for awhile, comes back to a convenient perch. After several repetitions of this behavior the eagle finally dropped into the marsh and stayed down for at least thirty seconds. When it came back out I was surprised that it was carrying a Blue-winged Teal. But I wasn’t as surprised as the teal, which was still alive! I imagine the teal was thinking some pretty unhappy things at this point. The eagle flew up to another palm stub and proceeded to pluck, dismember, and eat the teal. Remember, the teal was still alive. I have no idea at what point the victim was actually dead, but it can’t have been a pleasant way to go. I can’t imagine being plucked alive can feel good. 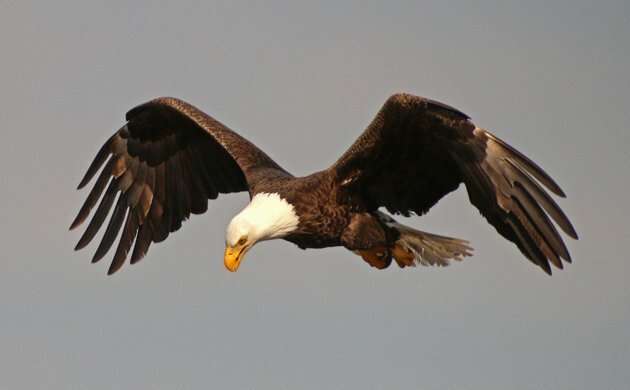 Also, note the eagle’s nictating membranes protecting its eyes from damage. While this might not be the most pleasant of wildlife encounters it was amazing to watch. And it is only one of the many spectacles you can see if you go to the Space Coast Birding and Wildlife Festival this coming January. I hope to see you (and lots of birds) there! Corey I was just going through 10000 Birds galleries as I often do to decide what bird may not be listed. I just returned home from a great day at Sacramento NWR where I was pleased to find several pair of Blue-winged Teal, so I did a search on to see how many other posts on this beautiful duck may be found, and voilà, I found this great post of yours. How could this have possibly gone out with no comments? 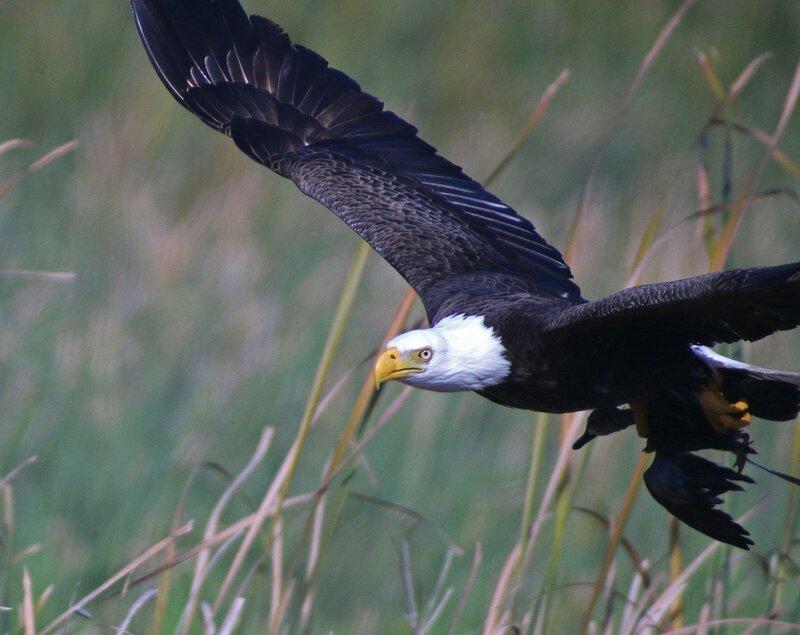 Firstly, I must comment on your incredible digiscoping skills, to get those in-flight eagle shots. Very nice! My favorite photo of the group however, would have to be the first photo of the eagle tearing up the duck with feathers flying. I only have one question. 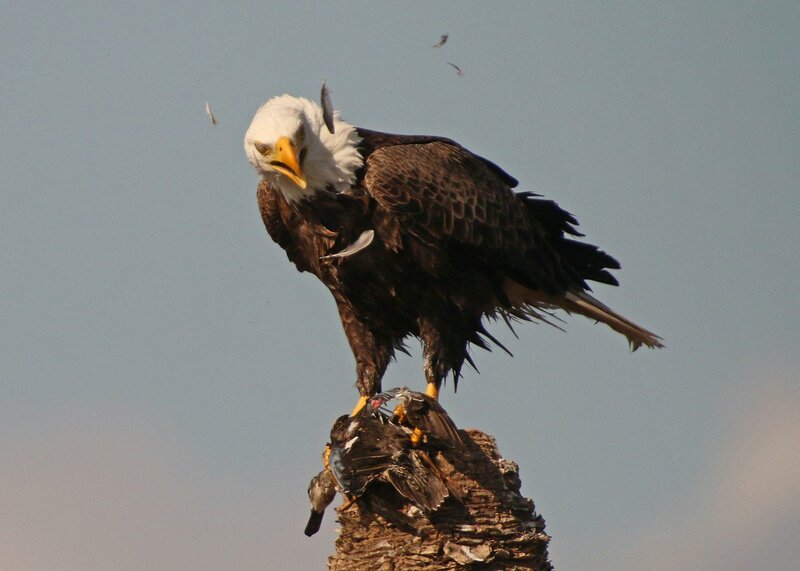 The video shows the eagle getting ready to swallow the poor teal’s head, including its beak! Did it swallow the entire head? And the eagle just dropped the head. Must not have been a zombie. And thanks for bringing up galleries – it reminded me I have to get February’s added to the page!